Jack Alexander Huston (born 7 December 1982) is an English actor. He appeared as Richard Harrow in the HBO television drama series Boardwalk Empire. He also had a supporting role in the 2013 film American Hustle, and played the eponymous Ben-Hur in the 2016 historical drama. Huston was born in King's Lynn, Norfolk, the son of Lady Margot Lavinia (née Cholmondeley) and actor, writer, and assistant director Walter Anthony Huston, known as Tony Huston. Huston decided to become an actor at the age of six, after playing the title role in a school production of Peter Pan. He later attended Hurtwood House, a drama institute. His mother is English and his father is American. His paternal aunt is actress Anjelica Huston, and his paternal uncle is actor Danny Huston. His paternal grandparents were American director John Huston (who became an Irish citizen) and model/dancer Enrica Soma, and his maternal grandparents were Hugh Cholmondeley, 6th Marquess of Cholmondeley and Lavinia Margaret (née Leslie). Huston is the nephew of David Cholmondeley, 7th Marquess of Cholmondeley. On his father's side, he has Italian, Irish, Scottish, and English ancestry, and is a great-grandson of Canadian actor Walter Huston. Through his maternal grandfather's father, George Cholmondeley, the 5th Marquess, Huston is descended from Robert Walpole, the first Prime Minister of Great Britain. Jack's maternal grandfather's mother, Sybil Sassoon, Marchioness of Cholmondeley, was from a Jewish family (from Iraq, India, and Germany); through Sybil, Jack is descended from both David Sassoon, the Treasurer of Baghdad, and Mayer Amschel Rothschild, who founded the Rothschild family international banking dynasty. Huston started his film career with a small screen adaptation of Spartacus, where he played Flavius. He then went on to having more prominent roles in such films as Factory Girl, playing the American poet Gerard Malanga, the horror film Shrooms, Outlander and Shrink. In 2010, he played the minor role of Royce King in The Twilight Saga: Eclipse. He appeared in HBO's Boardwalk Empire as Richard Harrow, a severely disfigured World War I marksman turned gangster. On 16 December 2010, it was announced Huston would be made a series regular after appearing in five episodes of the first season. After this he went on to be directed by Al Pacino in the 2011 film Wilde Salome and to having starring roles in Not Fade Away, Two Jacks and Night Train to Lisbon. In 2012, he played the part of narrator on avant-garde musician John Zorn's album A Vision in Blakelight, an homage to William Blake. In 2013, he appeared in David O. Russell's comedy-drama American Hustle, as Pete Musane. Later that year, Huston played Charles Bruno in Strangers on a Train at London's Gielgud Theatre. He will be guest starring in the seventh season of the VH1 television series Eyes Closed, with James McAvoy and Kate Winslet. Huston began dating American model Shannan Click in 2011. Huston and Click have one daughter born in 2013, and one son born in 2016. 2012 Tron: Uprising Rasket (voice) Episode: "Tagged"
2018 The Romanoffs Samuel Ryan Episode: "House of Special Purpose"
^ "Person Details for Jack Alexander Huston, "England and Wales Birth Registration Index, 1837-2008" – FamilySearch.org". ^ "Welcome – Hurtwood House Performing Arts". hurtwoodhouseperformingarts.co.uk. Archived from the original on 21 February 2010. ^ Geoff Berkshire. "'2 Jacks' Review: Bernard Rose's Fourth Tolstoy Adaptation – Variety". Variety. 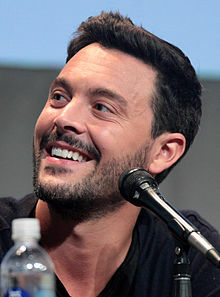 ^ "Jack Huston". IMDb. Retrieved 29 May 2018. ^ Huston, John (1994). An Open Book. Da Capo Press. p. 9. ISBN 978-0-306-80573-8. ^ John Richardson. "Houghton Revisited". Vanity Fair. ^ "Heavy Lies the Coronet on a Lord of Cinema". The New York Times. 14 December 1997. ^ Stanley Jackson (1968). The Sassoons. Heinemann. ^ "The Crow – Will Jack Huston Fly?". Dread Central. ^ Nellie Andreeva (December 2010). "Jack Huston Upped To Regular on HBO's 'Boardwalk Empire'". Deadline. ^ Zach Dionne. "David O. Russell's New Film Adds Jack Huston". Vulture. ^ "Acting dynasties collide in revival of thriller Strangers on a Train". London Evening Standard. 16 October 2013. Retrieved 16 January 2014. ^ "Fatal Attraction and Strangers on a Train head to West End stage". bbc.co.uk/news. BBC News. 20 September 2013. Retrieved 16 January 2014. 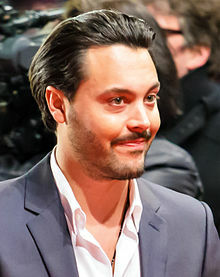 This page is based on the Wikipedia article Jack Huston; it is used under the Creative Commons Attribution-ShareAlike 3.0 Unported License (CC-BY-SA). You may redistribute it, verbatim or modified, providing that you comply with the terms of the CC-BY-SA.